When the temperature dips and you're bundled from head to toe, the last thing you'd like to do is fumble with your touchscreen or the itsy-bitsy buttons on your cellphone to pick up a call. Fortunately, you don't have to give friends and family the cold shoulder when you can keep your fingers toasty and answer calls with these tech-enabled knit gloves. Using Bluetooth technology, these inconspicuous mitts sync with your smartphone. To answer calls, simply use the classic "call me" pantomime—the left glove's thumb contains a speaker and the pinky packs a petite, but powerful, microphone. Fabric-covered buttons for "Answer" and "End Call" are sewn into the right glove's wrist for added convenience. A lithium-ion battery (charged via USB) holds a single charge for 10 days on standby and allows you to chat for up to 20 hours! Setting it up sounded easy but I couldn't get it to work for quite awhile. I had to try at least a dozen times to connect it wirelessly to my phone. Once I got it working, I could barely hear the person talking, and they had a lot of difficulty understanding me. I knew they would be very frustrating to use so I returned them. Unfortunately I do not get the duty or shipping back and I had to pay to ship it back to the company. I lost about 50$ in the end. Not happy and would not recommend this product. 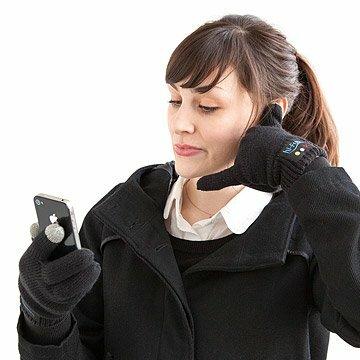 Using Bluetooth technology, these gloves sync with your smartphone to receive calls.